A personalized sequence of dots and dashes spells out secret messages, mantras, or dates of your choosing. Yep, you just cracked the perfect gift code. Personalize three bracelets and a necklace with secret messages, mantras, or important dates of your choosing—think LOVE, or NAMASTE, or even a sneaky MARRY ME? With delica beads from Japan, silk cord from Germany, and brass beads from Thailand, you can save the SOS for another time: You're all set with this kit. Assembled in Venice, California. I did make one necklace and three bracelets. Instructions were clear. 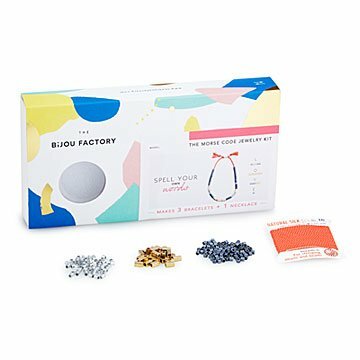 Product is fun and easy to use. I wish it came with more beads. There are a lot of gaps when I wear the bracelets so you can't see the Morse code as well on the bracelets.